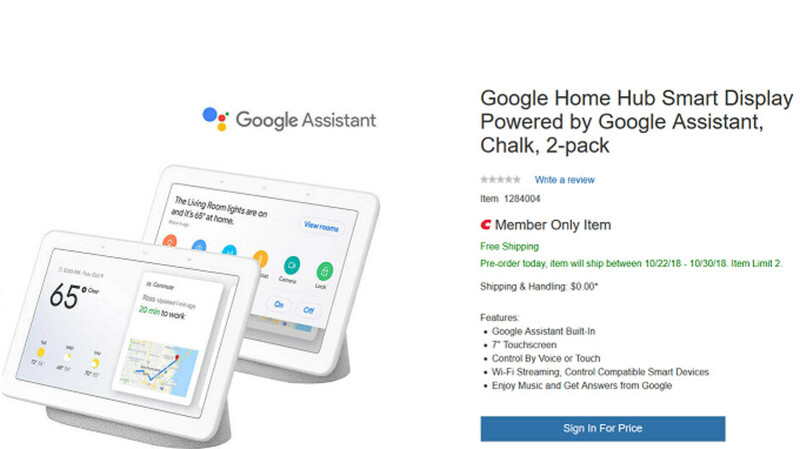 Now, there is a deal on the Google Home Hub from membership warehouse club Costco. The latter has a little more experience selling technology than Home Depot does, and since it is known for selling items in bulk, perhaps the deal shouldn't be surprising. If you're a Costco member, you can purchase a two-pack of Home Hub units for $249.99. That works out to a savings of $48.01 or 16%. With this deal, you are purchasing each unit in the two-pack for approximately $124.99. Costco is selling the two-pack in Chalk, and shipping is free. Pre-order today, and the smart displays will ship between October 22nd and October 30th. The Home Hub features a 7-inch touchscreen, and you will be able to view YouTube and Netflix videos, stream music with lyrics, monitor Nest security cameras strategically placed around your home, and watch recipes completed right in front of your eyes. Of course, with Google Assistant, there's much more that the Home Hub can do for you. If interested in snagging a two-pack at a good price (and remember, the holiday shopping season will soon be here), click on the sourcelink below. I believe the Echo Show is better...I would like to see compatibility with Airplay, etc to allow seemless streaming.